I have recently attended a fun and informative “Love Food Hate Waste” training, organised for Westminster Council’s Recycling Champions (a group of enthusiastic volunteers who help the Council promote recycling). We give talks and presentations to local residents, we run educational sessions for children, we run recycling and upcyling-related workshops, so we thought we “knew it all” about waste. We were all surprised that we can freeze eggs! – best to beat them until the yolk and egg white is just about blended, and then put them in an airtight container to freeze. Egg white and yolk can also be frozen separately. We can freeze bananas (with no skin), tomatoes (blended)and cheese (but not soft cheese) – best to grate it and then freeze it. It looks like we can freeze pretty much almost all foods if stored properly – have a look here on what freeze or not to freeze. Food waste: we hear a lot of about tons of food being wasted but these numbers made us particularly concerned as they refer to how much we throw away DAILY in the UK: 5.8m potatoes, 1.5m sausages, 1.4m bananas and 1.1m eggs, and 24m slices of bread! 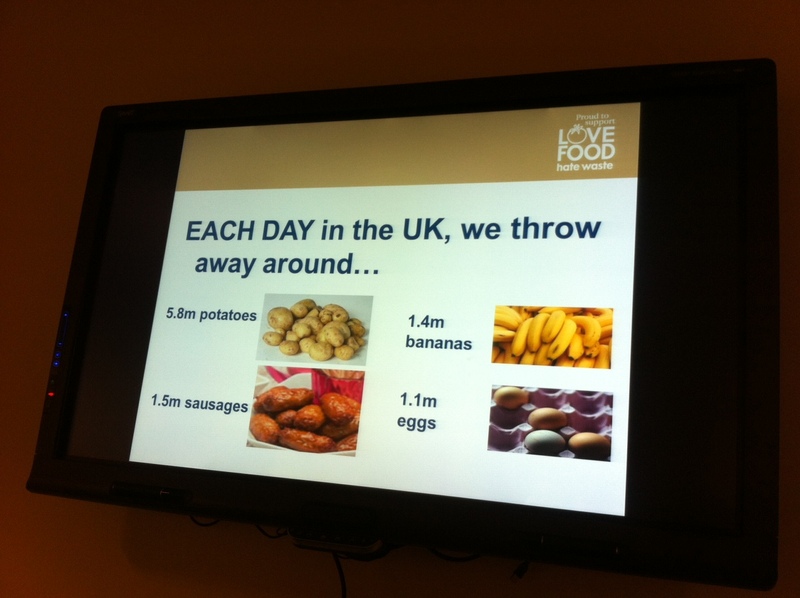 We throw away about 5kg of food per person per week. Also, we have learnt that out of 70,000 tonnes of breakfast cereal is thrown away each year in the UK, over 27,000 tonnes (39%) is thrown away because too much has been served, which also adds to the amount of wasted milk. Storing food: it turned out that some of us keep rice in the fridge for over three days (wrong! old rice can cause food poisoning and should be eaten within 24 hours of cooking) and keep leftovers in the fridge for a week (wrong again: two days, in a container with a lid or covered with cling film). All of us wrongly thought that eggs should not be stored in the fridge. I also learnt that most fruit and veg will stay fresher for longer if kept in the bag they came in – I have always believed (for no particular reason) the bag makes them go rotten. And apples and broccoli will stay fresher for longer if kept in the fridge, but bread will stale six times faster. Do you know what the optimum temperature for the fridge is? And, more importantly, do you know what the actual temperature of your fridge is? Apparently, most fridges are about 2 degrees Celsius warmer than supposed to, which makes food go off quicker (for example, milk by two days). It is well-worth having a look at the Love Food Hate Waste website for more fascinating facts and useful tips. Even if we think we know it all. Because, most likely, we don’t. This entry was posted in Uncategorized and tagged food waste, recycling, sustainability, zero waste. Bookmark the permalink.